Provides real-time visualization of bacteria in chronic wounds. Integrates into hospital acute care workflows. Allows clinicians to better analyze the bacterial condition of chronic wounds with no patient contact or contrast agents. For the first time, clinicians will be able to visualize bacteria in chronic wounds, this is particularly important for patients in an immunocompromised condition where the signs and symptoms of high bacterial loads or infection are not present. 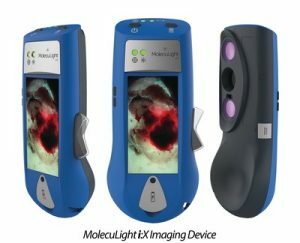 The MolecuLight i:X enables clinicians to quickly, safely, and easily visualize and precisely target clinically important bacteria in and around chronic wounds, in real-time at the bedside allowing them to initiate targeted and precise treatment plans. “Canadian clinicians will now have a powerful new tool for more objective assessment of wound bacterial status and better antimicrobial treatment decision making” says Dr. Ralph DaCosta, Founder, CSO and Director of MolecuLight Inc.